Shoe-Horning A Set Of Headers In A Box Nova Just Got Easier. No matter what kind of car you have, or what you plan to do to it, installing a set of headers should be one of the first-and possibly easiest bolt-on upgrades you make. Freeing up the exhaust frees up horsepower, and the rumble of individual pipes never hurt the look and sound of a mean machine traversing the boulevard. But not all decisions are easy when it comes to choosing an exhaust alternative. One of the first problems associated with installing tubular headers is usually the fact that the current engine in your ride might not be the same size or shape as the original. This was not too much of a problem for us since a small-block will usually fit nicely in any engine compartment. Depending on the car in question, the steering box, the transmission, the front suspension, and its ground clearance will be the greatest factors in determining what type of manifolds or headers can be used. In this quick tech segment, our goal is to show you just what it took to determine what type of headers would work with our little Deuce's potent 355-inch mouse, which replaced the original six-banger. 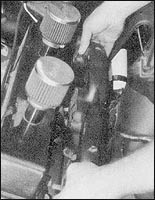 To be more specific, we started out with a set of conventional full-length, under-chassis-style headers, which were useless after realizing this design not only rested against the passenger-side subframe rail, but the driver-side collector dumped straight out into the transmission's shift lever. Had the car been equipped with a Turbo 350 instead of the Powerglide, only one of our dilemmas would have been solved. So we took this as a learning experience and thought we'd share it with you (You know, a "don't waste your time" type of thing). Now we were left with the dilemma of finding another set of headers, mostly because the motor has been hot rodded enough to need the extra breathability. Fortunately for us, Classic Performance Products offers a system built exactly for small-block-powered Novas. It's a good thing because we had almost given in to using factory ram-horn-style manifolds, which would have worked, but how cool would that be? And besides, we needed a performance header for more than just aesthetic reasons, As you will see on the following pages, CPP put a lot of time and forethought into building a header that would drop into place, easily clear all of the above-mentioned obstacles and allow a built small-block to breathe as It should. In addition, these headers really gave the engine compartment some much-needed flavor with the up-to-date look and longevity of their ceramic-metallic coating. Finally, unlike many header-installation projects we've all encountered, the CPP headers literally slipped into place and bolted to the heads with no problems. It's easy to see that the steering box and shock tower plays large role in what type of header or manifold we can use. Even if we squeeze by these obstacles the transmission shift linkage is still going to be a factor as we will see in the following photos. Oops! Trial and error. It looked as though the header would just slip into place from topside, but in reality the only way these were going in was from the bottom. 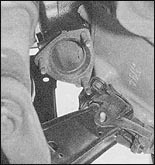 Here is what we were talking about: The header dumps directly onto the shift lever of the transmission. This would take much more than a couple of 90-degree bends to make it around the linkage. On the passenger side there was only one problem, and we aren't gonna move the subframe over to clear the exhaust. This style header is just not going to work on either side. As a last-ditch attempt we tried on a pair of factory exhaust manifolds. As you can see, the factory manifolds will clear everything nicely on both sides of the engine. Don't wo~ we'll put a nut on that motor mount bolt! These headers certainly look like the answer to our problems. CPP uses a ceramic-metal coating to keep the tubes looking great for a lifetime. 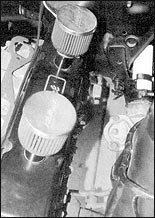 Although they look similar to the ram-horn-style manifolds, they are very specifically designed for the '62-67 Nova engine compartment. On the passenger side. the header drops right Iinto place just like the driver side. With all necessary hardware included, these headers are ready to install right out of the box. There is no problem dropping these headers in from the top. Because of the bends in the hunt and rear tubes, the second bolt will need to be installed before the outer ones. Remember to leave enough of a gap to slip the header gaskets into place. Mr. Gasket sent us the necessary parts to complete our install and seal any space between the head and headers. The design of these headers really shows on the passenger side. Once all of the header bolts are tight check around all the nooks and crannies to make sure everything is clearing the header by at least 114 inch. Any exhaust guy worth his salt should be able to build a tight-fitting exhaust from these collectors. There is plenty of free space around each side. So now that we have cured the header problems, we'll get right on those motor mount nuts.